When I hear the word "segregation," I immediately think of the sort of racial segregation that could be found throughout much of the southern U.S. prior to the Civil Rights movement. I think of racially segregated schools, drinking fountains, restaurants, and so on. This sort of racial segregation was not simply a matter of local custom or preference; it was enforced through the application of police power. A Black person who entered a "Whites only" area could be arrested and charged with a criminal offense. Remember the violence? Remember the images of police dogs and fire hoses? As we looked at this sad state of affairs, we sought change. We imagined a future without "Whites only" signs, a future where Blacks would be free to use the same facilities as Whites. And as we did so, I'm not sure it ever occurred to us that institutionalized segregation might someday be replaced with the various forms of self-segregation that seem so prevalent today. To be clear, one can still find institutionalized segregation enforced by police power today, although it tends to be more about income (e.g., police driving homeless people out of various areas) or gender (e.g., gender segregated restrooms) than race. It is also easy to find examples of racial segregation that look a lot like what was in place prior to the Civil Rights movement even though they are not enforced by police power. For one of the most dramatic examples of racial segregation today in the U.S., one need look no further than Christian churches. While there is some evidence that congregations are slowly becoming more racially diverse, there is also evidence that efforts to increase racial diversity may not be particularly well received by many of those who attend them. Exceptions aside, most of the racial segregation I see today is not institutionalized. Most of it involves self-segregation, or people preferring to gather with individuals of the same race. As I walk across the university campus where I work, I see an area where large groups of Black students gather. In the dining facilities, I see concentrations of Black students in certain locations and concentrations of White students in others. Of course, there are also plenty of Black and White students sitting together and interacting without the police showing up. But the point is, things look far more segregated today than I think we ever imagined they would. I'm not entirely sure how to feel about this. There was a bit of controversy recently when the American Humanist Association (AHA) announced that they were launching initiatives for racial justice, women's equality, and LGBTQ rights. 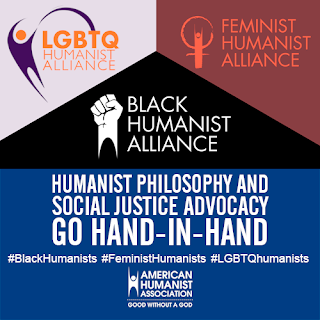 As described in their press release, they are forming a Black Humanist Alliance and relaunching a Feminist Humanist Alliance and a LGBTQ Humanist Alliance. I happened to be online at the time the announcement was distributed, so I was able to see many of the reactions being expressed in real-time. While many of the negative reactions mentioned Humanism+ (you may recall the disaster that was Atheism+), many also mentioned segregation. Specifically, the formation of these identity-based groups was characterized by some of those objecting as divisive and alienating to those who were not a member of one of these groups. There were also several accusations that whoever was operating the AHA's Twitter account at the time was blocking anyone who expressed any sort of criticism. I wrote a post in 2014 called In Defense of 'Black Atheists' Groups in which I said that I could understand why some Black atheists might like to belong to a Black atheists group. I feel the same way about these humanist groups. In fact, I've always thought that having an explicit focus on social justice in humanism made far more sense than it ever did in atheism. I do not regard the existence of such groups as inherently divisive or alienating. I wish they were not necessary and I am glad that they are not necessary for many people, including many who are members of the groups they represent; however, I am not prepared to condemn them. I think they can serve valuable functions for their members. A few politically right-leaning atheists will inevitably object that having a Black Humanist Alliance is racist and/or hypocritical because there will never be a White Humanist Alliance. Given historical and contemporary race-relations in the U.S., I don't find this claim to be particularly compelling no matter how many times I hear it.